Sebastian Vettel and Kimi Raikkonen ensured absolute cracking weekend for Ferrari as the duo completed first one-two on the podium this season. Vettel wins the 2017 Monaco Grand Prix and now leads the championship by 25 points after just 6 races in the season. Lewis Hamilton could only finish 7th and now faces uphill task to turn things around. Raikkonen and Ricciardo finished second and third respectively on the podium. As far as the results go, Ferrari absolute bossed the weekend from start to finish and they also put Mercedes under real pressure now by putting on a great performance and matching them on every level. Monaco Grand Prix result pretty much sets the tone for remainder of the season and Mercedes will have to up their game to get back on winning ways. We move to the sixth formula 1 grand prix of the season which takes place in Monaco’s Monte Carlo circuit this weekend starting unusual Thursday, 25 May 2017 practice session. There won’t be any activity on Friday while the qualifying takes place on Saturday, 27th May followed by the big race on Sunday, 28th May. Only six points seperate Vettel and Lewis Hamilton who both have won 2 races each and this weekend will be crucial one way or the other in championship race. After 5 grand prix’s this season Formula 1 moves to Monte Carlo for 2016 Monaco F1 grand prix which will be taking place this weekend starting with traditional thursday practice sessions. It will be the 74th edition of iconic F1 grand prix which comes with glitz, glamour and alot of excitement every year. Nico Rosberg will be looking to win his fifth grand prix of the season having won here each of the last three years. Short Preview: Nico Rosberg leads the Formula 1 championship table with 100 points having won four grand prix’s so far this season and he will be eager to put away the disappoinment of Spanish Grand Prix crash with teammate Hamilton which resulted in both Mercedez cars unable to finish the race. Ferrari has close the gap with both Kimi Raikonnen and Sebastian Vettel getting podium finish. Looking at the past results, Ayrton Senna has been the most successful driver at this circuit having won the Monaco grand prix for record 6 times including 5 back to back wins from 1989 to 1993. Damon Hill and Schumacher has won the Monaco GP 5 times each followed by Alain Prose who has 4 victories on this track. Rosberg can go level with Prost with a win on Sunday as it will be his fourth consecutive win in Monte Carlo. There is alot at stake going into the highlight grand prix of the season and Hamilton must start to outscore Rosberg if he were to have a decent chance of making a title challenge. There will be no action on Friday as traditional Practice 1&2 take place on thursday while the Friday is left out and practice 3 takes place on Saturday morning with the qualifying starts in afternoon. Qualifying Results & Highlights: The qualifying session will be taking place on Saturday, 28th May 2016 starting at around 14:00 CET / 13:00 uk time. We will have the qualifying results and full replay video right here on this page shortly after the qualifying sessions is over. Lewis Hamilton won his first grand prix of the season after he came out triumph in Monte Carlo, Monaco Grand Prix 2016. Daniel Ricciardo who had incredible weekend, taking pole position and pretty much having Monaco GP in the bag was left devastated as a pit-stop strategy went all wrong costing him first place in Monaco GP. Force India’s Sergio Perez finished third on the podium. After the first four grand prix’s F1 season is becoming alot more un-predictable. Drivers championship leader Nico Rosberg could only finished 7th having started second on the grid. Monaco Grand Prix Results: So Lewis Hamilton, Ricciardo and Perez takes the podium places while Sebastian Vettel and Fernando Alonso finished 4th and 5th respectively. How the championship standing looks: Rosberg still leads at top of the standings with 106 points but Lewis Hamilton has reduced the gap after winning in Monaco and now only 24 points separate the two. 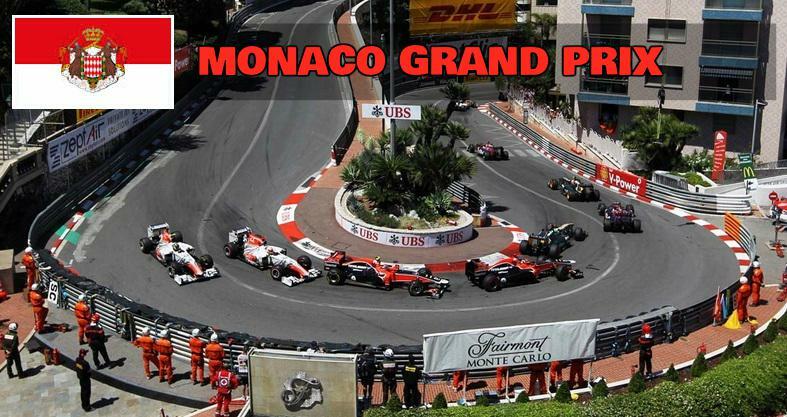 You can tune in on this page couple of hours after the race to get extended monaco GP highlights and replay video. How is it that the adds are streamed virtually glitch free but the Monaco F1 Qualifying glitches every two seconds? different bitrates for live TV vs pre-recorded ads. I’m SO glad to see these new cars preform. With the new design, it not only makes the race more competitive, but is still pushing the envelope while keeping the drivers safe. Way to go FARRARI for the win!